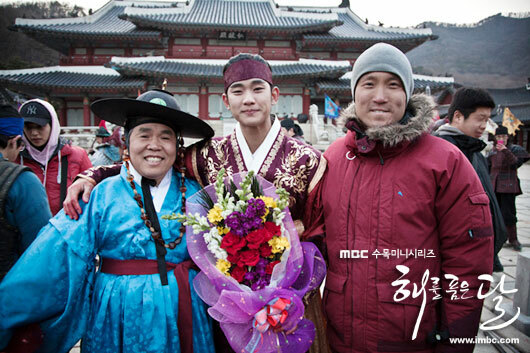 The final filming scene of The Moon that Embraces the Sun was immersed in the environment of couldn’t bear to part. And the first actor to be affected by the sentiment is the lead actor Kim Soo Hyun. After the end of the drama on March 15th, 2012, the official homepage of The Moon that Embraces the Sun published several video clips from the set when the final filming for respective actors were done. The BtS video clips start by showing the production of the last scene of the actors in the drama. One of the most interesting video clip showed the filming of the death scene of Yang Myung (played by Jung Il Woo). 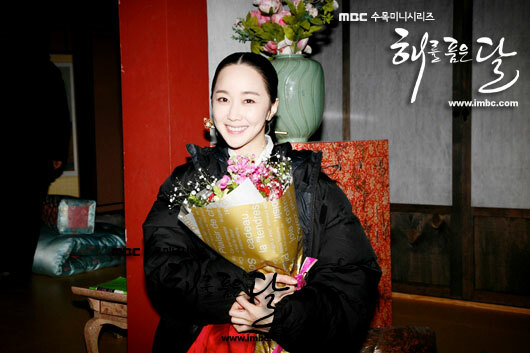 After the end of the filming, director Kim Do Hoon presented a bouquet of flowers to actors who had done their filming. As the actors hugged each others with a mixed emotions of happy yet regretful and sad, Kim Soo Hyun couldn’t control his emotion and tears of couldn’t bear to give up began to flow as he hugged Jung Eun Pyo. Netizens said, “Oh, even my heart feels hurt,” “Sisters let’s go to comfort him,” and so on. In the interview, Kim Soo Hyun said, "Well, the drama finally... I felt it's really short time. So sad that it's now all over. I am happy and grateful that I can meet such a good lot of people during the shooting. It's an honor. I will do my best in future."